Solving the Senior Transportation Problem With Your Help! Look what popped up! 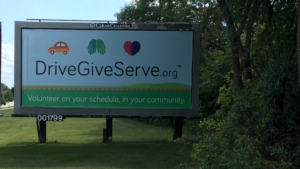 Drive.Give.Serve billboard located in Port Washington on the Corner of Spring Street and Hwy 32 heading south. Another faces north the opposite direction.